Ken Landon is director of San Angelo's International Waterlily Collection and a city parks employee. For years he worked tirelessly as a volunteer. His day job was at Olive Nursery. In fact when the city tried to raise his pay in 2003, Landon turned it down. "I told the director (of city parks Carl White) to build my pools," Landon said. "I need more water space so I can work twice as hard and make everybody happy. I want people to come to San Angelo." Landon takes pride in transforming an eyesore at Civic League Park into a jewel of international prestige. It has taken 15 years, and he isn't finished. He is a distinguished member of the International Waterlily Society Hall of Fame. Landon has been cultivating waterlilies since he was 17, captivated by their stunning beauty and their potent perfume - all from a gob of mud. 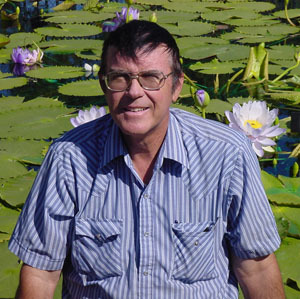 Landon worked on research of waterlily species for the University of Texas, Austin, in the mid-70's. By the late 70's, he had amassed the largest collection of waterlilies in the world, and included some of the rarest species. 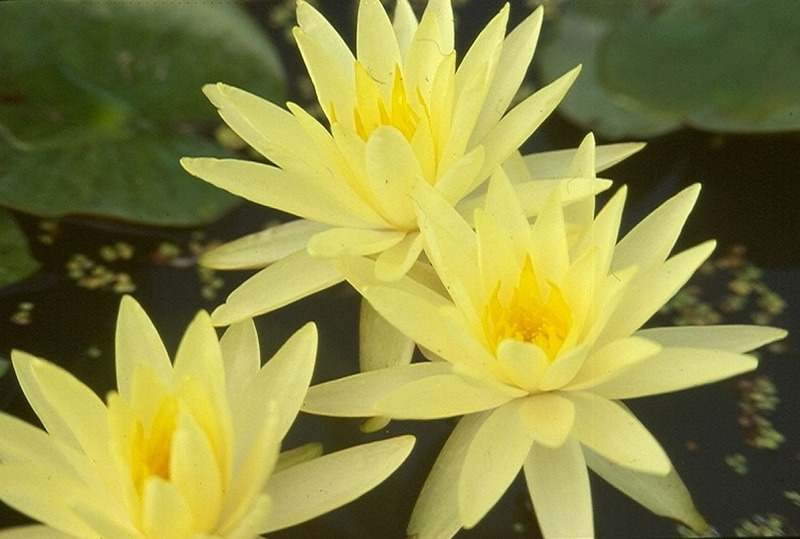 For example, the Internaional Waterlily Collection at San Angelo has the only true specimens of the Zanzibar Waterlily (Nympheae capensis var. zanzibariensis) known to exist. His stock came from Charles Frase, who collected them from the island of Zanzibar in 1941. The tubers have been propagated asexually ever since, and the genetic purity has been maintained. No one else in the whole world has that waterlily, and it is extinct in the wild. Landon has maintained that collection and added to it since then. Even with the addition of new pools in the last two years, less than 5% of the collection is grown out for display each year-not only in numbers of plants, but also in the selection of species and varieties grown out. The IWC inventory numbers in the thousands, and it is solely the property of Ken Landon and the International Waterlily Preservation Repository (IWPR). Although the city of San Angelo pays Landon a salary to present and maintain a display in the park, the waterlilies don't belong to the city. Without Ken Landon there would be no display. No other person or institution in the world could provide the inventory for the display or the skills and knowledge to cultivate and maintain the display. 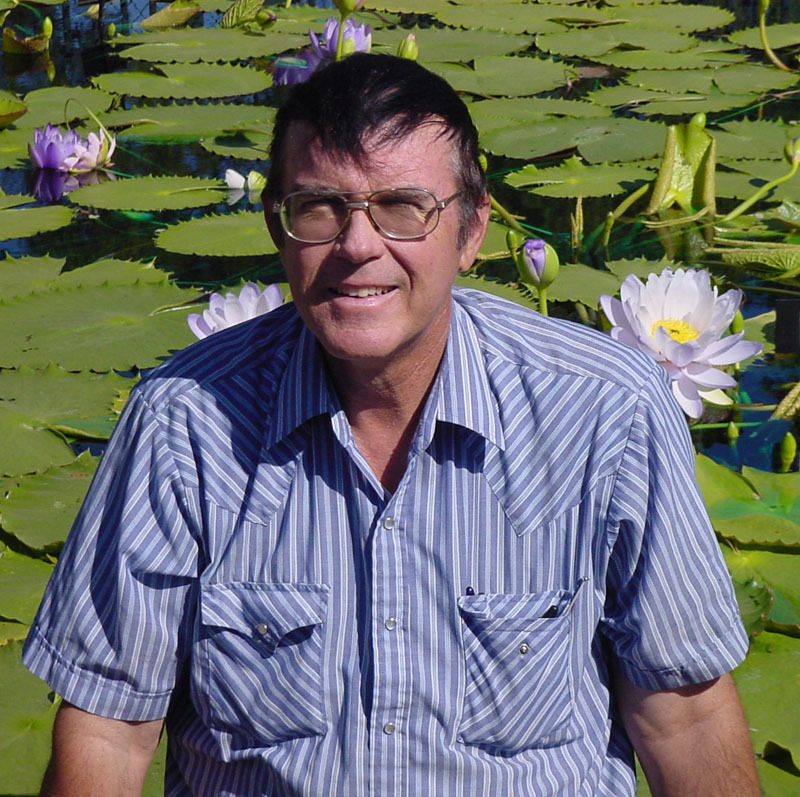 Ken Landon IS the International Waterlily Collection and the San Angelo waterlily display. Mostly, what Landon values are expressions of appreciation. "What I have a hard time with is people walking by and saying, 'Yeah, pretty flowers. So what? '" Landon said. "When somebody says, 'Hey! That's a Zanzibar.' Or 'Hey! That's a stellata from India.' Or 'Hey! That's rubra. Where did you get that?" "When they know that they're already gone in the world and they come and see them, that's really important to me. Because I know that they know And they know that I know they know So that's good." Landon keeps a framed image captured three years ago by a Standard-Times photographer. "We had a class down there," he said. "As you get a little older, you realize the value of it, especially if you've got the last of their kind in the world. "There was this young girl - probably 17-holding these seeds in her hands. "To me, here is a young kid who may or may not care. But there she is in the springtime of her life holding some of the last of their kind in the world. And she's got 'em. "It's a dichotomy" he said. "This plant has been around 150 million years, and they're about gone because mankind and our encroaching population and how we're not taking care of our world. And she's got these things in her brand new little hands. And that just struck me." "That's why I do this," he said. "As long as the good Lord lets me do it, there's going to be a nice collection down there for the world to see. "That's what you're here for, right?" In 1988, Reta Sage and Irene Meitzen, leaders of the San Angelo Council of Garden Clubs, proposed the lily garden idea. Landon agreed to work for nothing, but the City Council turned them down. Stephen Brown, city manager at the time, persuaded the Council to reconsider and also spend $2,000 for a fence Landon requested to keep out varmints bent on devouring the lilies. By one vote, the council agreed. Landon overhauled the Works Projects Administration pool, built in 1933. It had become a dumping ground and a hangout for dope dealers and vagrants. Early on, Landon was helped by the San Angelo Council of Garden Clubs. For the last several years most of this work has been accomplished and funded by Landon's own pocketbook. This includes the International Waterlily Collection and the International Waterlily Preservation Repository. 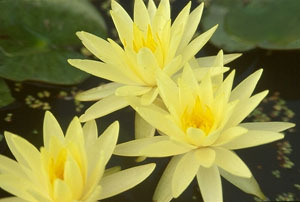 It was his personal efforts, persistence and unbelievable generousity that led to the first waterlily display. To say it was a hit is quite an understatement. It has grown because of Landon's tireless work, dedication and his unequaled collection of waterlilies. The bookish, plainspoken Landon, who holds an engineering degree from Albuquerque Technical Vocational Institute, also became president of the International Water lily Preservation Repository (IWPR) in San Angelo. His research with waterlilies continues. The IWPR is becoming the most important taxonomic authority on the genus Nympheae in the world. This is partly because Landon has the actual plants to study and collect data from, but also because the search for new species continues. Landon and his associates just published a description of a new species of waterlily discovered in Madagascar. This species displays such a varied array of characteristics and traits that is is probably the most significant new discovery in the last 100 years. In recent years, National Geographic and the Smithsonian have sent top nature photographers to San Angelo for archival images of rare and endangered water lilies. An Egyptian official came to San Angelo in 1994, searching for the Sacred Lotus of the Nile, which had vanished and was presumed to be extinct. "Yeah, we have it," Landon told him, pointing to a corner of the display pool. The visitor, delirious with joy, exclaimed, "That's it! Millions of seeds were collected, processed and shipped for propagation in the Nile River. "We're not selfish with what we have," Landon said. He explained that Third World countries worry about feeding their people, not protecting water lilies. "I've got one of the last strands of Zanzibars in the world," he said. "The Zanzibar is the one from which most colors come. There are no more. These plants were dug in the island of Zanzibar in 1941. A collector had them. He had divisions (roots) instead of seeds. The advantage is you get a pure strain every time. Sometimes bees can mess up your seed cache in a hurry"
In the last 20 years, as many as 20 species have disappeared Landon said. Spanish explorers visiting the site of San Angelo in the 17th century called the Cone River "Rio Florido" (Flowered River) because of all the blue waterlilies (Nymphaea elegans) thriving in the crystal clear spring water. No more. Landon said red-eared sliders, a turtle introduced in the 19th century, devour water lilies like Waldorf salad. Attempts to replant water lilies on the Concho have not succeeded. Part of his mission is to find, describe, catalogue and perpetuate endangered waterlilies. When the Star of Mexico appeared to be extinct in the 1970s, Landon headed for Guadalajara, Mexico. His published account reads like an "Indiana Jones" thriller. University of Texas professors had told him the Nymphaea flavo-virens could not be found. Using his wits, a native guide and a dugout canoe, Landon found the rare water lily in a leech-infested lagoon and brought back samples to propagate. The remote lake above Mexico City wasn't even on the map. In 2003, Landon grew a Victoria, which comes from the Amazon basin. It is the largest water lily in the world. No more than a dozen exist in the United States. Landon's trophy grew to an astonishing 8 feet, 8 inches in diameter, and dazzled a symposium in Houston. "There were no yellow star lilies," he said. "I decided I'm going to make one. It took me seven years, but I've got yellow star lilies that will blow your socks off. Everybody and their dog wants one. I grow it every year at the lily pool, and I named it for my mother. Nobody has made one since. A lot of people are trying. "People told me it couldn't be done," he said, noting that yellow pigment was extinct in species of water lilies. "I love to do things when people tell me I can't." Another lily he created - Rhonda Kay - is named for his two sisters. "When you have three-fourths of the species in the world at your disposal, there's nothing you can't do," he said. "That's what's so important about keeping the wild ones. If you don't have the wild ones, you can't have the pretty ones that are infertile anyway. It takes mankind to keep them going, but nature takes care of the species. If you don't have them, you don't have much of anything." That's why Landon works so hard to preserve waterlilies. "I think posterity is going to need this," he said. "Somebody 100 years from now is going to want to do this, too, and they're not going to be able to the way we're going. Because there's not going to be any more of them. "Water lilies are endangered just like the snail darter, but people don't think about that. "In 1993, we were sanctioned by the International Water Lily Society as a premier collection in the world," Landon said. "Now we have the largest group of taxons in the world. The most species of lilies. The largest N. gigantea from the Australian Outback. They grow to be 14 inches across." With about 60 species in the collection and including numerous hybrids, Landon can exhibit only a third per year. He grows them on rotation because he lacks adequate display space. Patrick Nutt, a retired horticulturist at Longwood Gardens in Pennsylvania, has worked with Landon for 30 years. He came to rely on Landon's gorgeous aquatic plants to bring 900,000 admiring visitors to the botanical showcase each year. "Ken is one of the best in the world," he said. All of the water lilies at the former Pierre S. du Pont estate, plus many more, are displayed in San Angelo's Civic League Park. An estimated 12,000 visitors come between March and September, the prime viewing season. "San Angelo has the most magnificent collection of waterlilies in the world," said Wayne Davis of Hunt Valley, Maryland. He is president of the International Waterlily and Water Garden Society in Bradenton, Florida. The modest display pools at Civic League Park don't compare with Longwood's 1,050 manicured acres, maintained by 70 full-time gardeners. But San Angelo's waterlily specimens have no equal. San Angelo's recognition has come because Landon has established himself as the world's leading waterlily hybridizers. To Landon, it's a dubious distinction. "I told (White) I don't care about the accolades and all the stuff I got on my walls," Landon said. "What's good is to have the people come down and see what we've got. This makes the world a better place." As many as five bridal couples a week repeat their marriage vows at the lily garden. If Landon is working there, and they ask him to leave, he does. He also learned that a despondent man came to the garden in the spring of 2003 intent on suicide. After smelling the blossoms and meditating amid serene splendor, the man found reasons to live. Landon usually is found in the lily pools, wearing his chest-high waders, black horn-rimmed glasses and "gimme" cap. Attending the black-tie Hall of Fame induction ceremony in Nashville in 2001 was not his idea of a great time. The event was a proud moment for his mother, even though illness prevented her from attending. Landon, 56, was reticent. "It was very prestigious, but these recipients were really old. I'm not an old guy really. "They brought me in there and introduced me to this ocean of people," he said. "They called me a legend in my own time." White had pressed him to attend, saying, "Don't you want to be honored?" "I get honored enough," Landon said. "What honors me is when somebody is looking at a lily and asking me, 'is that thing real?' And I hand it to him. Ken Landon is passionate about waterlilies. But not one thing he has ever done has been for personal glory or ego gratification in any way. He does this because he loves his work and waterlilies, and he wants to preserve all he can for future generations.